We have not published much information lately on the ethereal PaxLair Site .... sorry about that. BUT, we have a very, very notable event with lots of history! 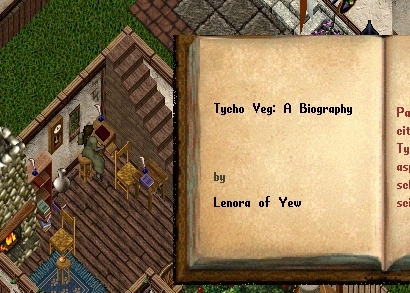 Yes, Lenora has researched and penned a Biography of Tycho Veg, a long-ago citizen and official of PaxLair City well before PaxLair became a Statehood. So this is many years ago, practically to the beginning of PaxLair (ca. 1998). Tycho Veg was one of then Mayor Winfield's chancellors and the one who also invented the flying machine ... among other contraptions. First copies of the book will be available for a mere 100 gold to help in the upkeep of the PaxLair Library in the Mage Tower. See the Library there for many more books of interest! We hope to see everyone at this event!